STAR training is applicable to people from all walks of life whether they have experienced a profound loss in a natural disaster, war, or are carrying hurts from something on a smaller scale such as a church conflict. STAR participants come to training sessions with questions as varied as: "How do I help people in my country deal with the earthquake?" to "I'm surrounded by conflict. How do I keep from burning out?" "By offering a safe space to address trauma which is often the 'elephant in the room,'" said Elaine Zook Barge (left), STAR is making a difference on an individual and collective level. Photo by Molly Kraybill. For 10 years, Strategies for Trauma Awareness and Resilience — the STAR program at Eastern Mennonite University (EMU) – has been helping to break that cycle. A February celebration at EMU marked a decade for this program that emerged at EMU’s Center for Justice and Peacebuilding from the ashes of Sept. 11. The STAR model has proven effective and is evolving for specific populations reported founding director Carolyn E. Yoder and current director Elaine Zook Barge. The two shared stories of transformation and future plans during the February celebration. University leadership, Center for Justice and Peacebuilding staff, STAR alumni and community members were also present during the event. 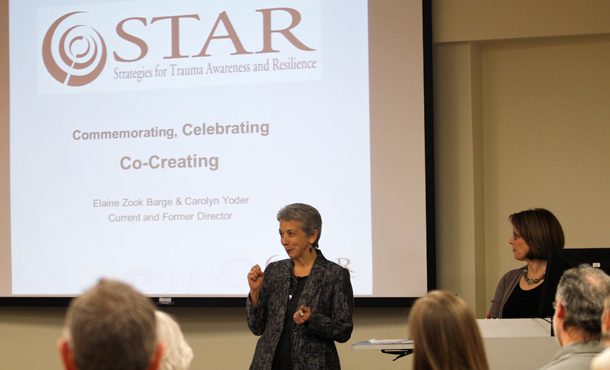 Both Yoder and Barge shared that previously living in international settings had laid a foundation for their work with STAR. “By offering a safe space to address trauma which is often the ‘elephant in the room,'” said Barge, STAR is making a difference on an individual and collective level. The STAR model breaks down disciplinary boundaries, melding the principles of restorative justice, conflict transformation, trauma healing, and faith into better practices for positive change. The week-long training raises awareness of the links between unhealed trauma and cycles of violence, along with ways to break those links and thereby emerge from the cycles. Barge and Yoder see barriers break down between people from opposing “sides” as a result of STAR training and hear reports of “increased resilience” for people working in high stress situations. “The information on the links between resilience and addressing trauma is very helpful to me in understanding how to stay healthy in the midst of a stressful work environment,” wrote a humanitarian aid organization worker from Syria after a recent STAR training. As STAR’s first director, Yoder facilitated over 50 trainings with about 800 people from 60 countries during STAR’s first five years. STAR has now trained more than 7,000 people worldwide. Today trainings take place in Harrisonburg, Va., across the United States and all over the world in places like Mexico City, Lebanon and Haiti. The material is easily adapted to different contexts and is effective whether taught outside under the trees, in a well-equipped conference room, or in a small church hallway. STAR trainers come with rich experience in different cultures and contexts; some offer the training in Spanish. The foundational STAR trainings – STAR Level I – are offered both on and off campus and can be taken for continuing education credits. STAR Level II trainings or “specialized” seminars are now available for those who have completed the first training and want additional tools for working with particular audiences. So far, these include STAR for youth, STAR for Healing Historical Harms and STAR for Transforming the Wounds of War, a program that helps communities support veterans. Plans are underway for the development of a certification process for those who want to become STAR trainers. A 38-page booklet, “STAR – The Unfolding Story, 2001-2011,” explores the program’s astonishing growth. The teachings of STAR are also outlined in the booklet, which is available as an e-book at emu.edu/cjp/star. To learn more, explore STAR training dates or register for a training, visit the website at www.emu.edu/star, call 540-432-4651 or email star@emu.edu.